Society of Friends of Russian Freedom flyer. Archives in Moscow, London and Washington DC reveal the story of an American writer’s influence on the Russian revolutionary emigration, finds postgraduate Ben Phillips. In a letter to the executive committee of the revolutionary populist group Narodnaia volia (People’s Will) in March 1882, the writer and sometime revolutionary terrorist Sergei Kravchinskii (better known by his nom de plume, Stepniak) insisted that the emigration to the West – then in its third and final stage before the events of 1917 – should conduct two distinct propagandas: one, characterised by revolutionary socialism, amongst the Russian youth, the other focused on stirring humanitarian outrage against the iniquities of Russian politics amongst the European bourgeoisie. ‘We can expect no sympathy in the name of our socialism’, he wrote. ‘We must acquaint Europe not with our political programme, but with the current state of the revolutionary struggle’ (Valk 1965, p. 345). For years, the emigration was Janus-faced. Looking west, Russia’s political outcasts at once presented themselves as moderate liberals and democratic socialists to the European bourgeoisie, whilst introspectively debating the merits of revolutionary terrorism and engaging with theoretical questions. 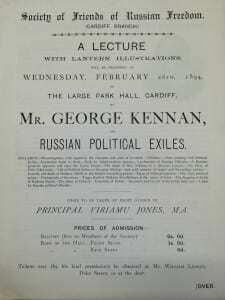 In this context, the story of George Kennan, with his web of contacts and personal friendships extending between the emigration and Siberia’s community of political exiles, and his writings on the Siberian exile system that were translated into Russian and disseminated illegally across Russia almost before they had appeared in English, remains one of the underexplored curiosities of revolutionary history. How did an American journalist come to transcend the audiences to which the emigration had previously spoken in two different languages and two different registers? A distant cousin of his Cold War namesake, Kennan’s interest in Russia dated back to the 1860s, when a two-year visit to the Kamchatka peninsula provided material for Tent Life in Siberia (1877). However, it was his second visit to Russia’s eastern domains in the mid-1880s that cemented Kennan’s legacy. From 1885 to 1886, Kennan’s research on the Siberian exile system exposed him to the worst iniquities of Tsarist autocracy and brought him into contact with many political prisoners with whom he remained friends. His damning findings were serialised by Century Magazine at the end of the 1880s and early 1890s, creating a sensation across the Anglophone world. During this time, he frequented the American lecture circuit, and was recognised as his country’s preeminent Russianist. His magnum opus, Siberia and the Exile System, appeared in two volumes in 1891 and remains his best known work as well as a significant source for those working on the history of Siberian exile. Kennan reached different audiences in different ways. Thomas M. Barrett has argued that it was through his American lectures, ‘more than anywhere else, that Kennan reached his public and became a celebrity’ (Stolberg 2005, p. 139). His oratory drew heavily on American melodramatic traditions and sensationalist representations of Siberia as a Ruritanian wilderness populated by terrifying natives and the exiled nobility of Russia’s western borderlands. Kennan’s trick was to add politics to the melodrama, along with a heavy dose of self-regarding chauvinism. Night after night, Kennan turned out the lights for magic lantern displays of political prisoners’ photographs, sang prison songs, disappeared mid-lecture only to return dressed as a Siberian convict and, on at least one occasion, reduced an audience to tears with an (unverified) anecdote of prisoners in a Petersburg forwarding prison flying the American flag to celebrate July 4th. (See Travis 1990. )Thus it is clearly true that in one sense Kennan tells us far more about American liberalism at the end of the nineteenth century than he does about Russia. 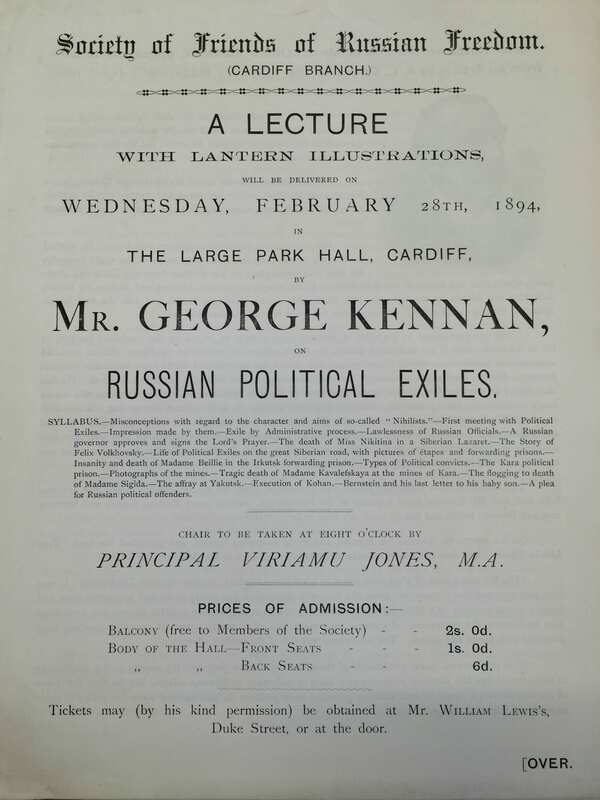 One can relate the figure of the political exile in Kennan’s writings and his lectures to the role of refugees from the 1848 revolutions in the mid-Victorian consciousness: both represented mirrors on the self.